One of the biggest challenges of running a successful website is balancing the needs of users with those of the business. This is especially true when an existing business model conflicts with user needs. Although not always the case, one situation where this conflict can arise is with franchise based businesses. For the last few years I have been working with a franchise business called Wiltshire Farm Foods. Although, their business model has been phenomenally successful it caused significant problems for their online customers. 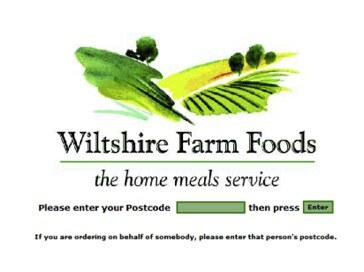 When hired to redevelop the Wiltshire Farm Foods website I saw an opportunity for a quick win. Before a user could enter the website, they were required to provide a postcode. This was a massive barrier to entry as users do not like handing over personal information (such as a postcode) without being given a reason. From looking at the website statistics it was obvious many users were abandoning the site because of this requirement. I couldn’t understand why the company had created such a huge usability hurdle. The answer was simple – Wiltshire Farm Foods had chosen to give their franchisees control over pricing. Without knowing where the user was located it was impossible to provide a price. The decision to give franchisee variable pricing was a good one in the pre e-commerce era. However, as the importance of the web grew, it created a significant problem when competing against large supermarket chains with a national distribution network and standardised prices. Although this was a problem for online users, the model worked for the business as a whole. Wiltshire Farm Foods had an incredibly successful relationship with its franchisees. Some had been with the company since day one. The business was driven by the entrepreneurial spirit of its franchisees and independent pricing was a key component of that success. With the variable pricing constraint remaining unmovable it became a case of managing the impact. Our first step was to move the point at which users were asked for a postcode. Instead of requesting it up front, we only asked for it when users asked for a price. This allowed users to view products and clearly linked the request for a postcode with pricing. We also explained why this step was necessary to reassure users this was not a ploy to send them unsolicited mail. However, ultimately we could not get around the extra step required to see prices. It would have been counter productive to dig our heels in and refuse to compromise the user experience. Instead we took a pragmatic approach and worked within the business constraints. Ultimately this worked in our favour. When Wiltshire Farm Foods saw the increase in sales that came from moving where users entered their postcode, it encouraged them to consider changes in their business model. Users now get a web price for each product when they arrive on the site for the first time. This price is then ‘adjusted’ once they login or provide a postcode. The user is notified of the change and because the price normally decreases they are generally happy. It is not ideal but it is a dramatic improvement that has greatly increased sales. Although the introduction of web prices is significant, it has not been the biggest change in the site. The real change has happened in my own thinking. In the beginning I saw the franchise model as a hurdle to overcome. However, I have since come to realise the benefit it has to the overall user experience, especially for the site’s target audience. The Wiltshire Farm Foods audience is elderly with the average purchaser being in their eighties. Not only does this audience have certain accessibility requirements, they also have a number of concerns that need addressing. One of their biggest concerns is security, both when purchasing online but also when meals are delivered. They are nervous about letting strangers in their house and yet need help unpacking and storing their meals. The Wiltshire Farm Foods franchise system accommodates this perfectly. Customers always get the same driver and feel they are dealing with a local supplier rather than a national brand. They can even pay with cash on delivery and place new orders directly with the driver. The problem was that the website did not reflect this local caring service. I was so preoccupied with the negatives of the franchise system, that I failed to identify it as a major selling point. Fortunately as I grew to understand the business model, I was able to grasp what Wiltshire Farm Foods had known since the beginning – that service was what set them apart. Wiltshire Farm Foods did not need to be overly concerned about universal pricing because they offered things no national supermarket could. They offered a friendly, caring service from police checked uniformed drivers. These drivers would even unpack meals and take next orders. However, most importantly they were a local supplier who customers came to know personally. Once I understood this important selling point it fundamentally altered my approach to the site. The homepage shifted away from merely showing products to promoting the service that was supplied alongside the meals. The homepage now focuses on promoting these ‘value added’ services through the use of animation. However, more importantly we made a feature of postcode entry. 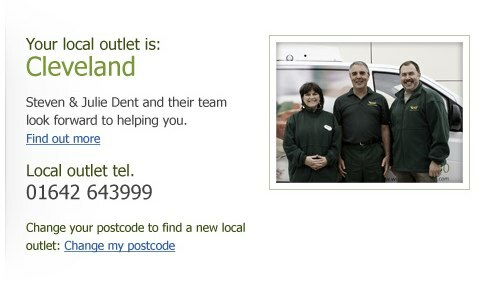 Entering your postcode no longer just revealed your region specific pricing, it introduced you to your local franchisee. Gone was the faceless national brand and instead you were given the names and phone number of your local supplier. Soon you will even see a photograph of your local franchisee and details about their delivery schedules. All of this helps to reassure the user and personalise the experience. Computers are seen by many (especially the elderly) as impersonal and cold. 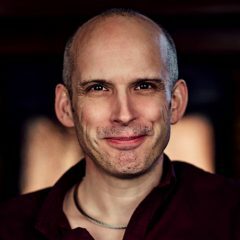 Techniques like this humanise the experience and connect with users. 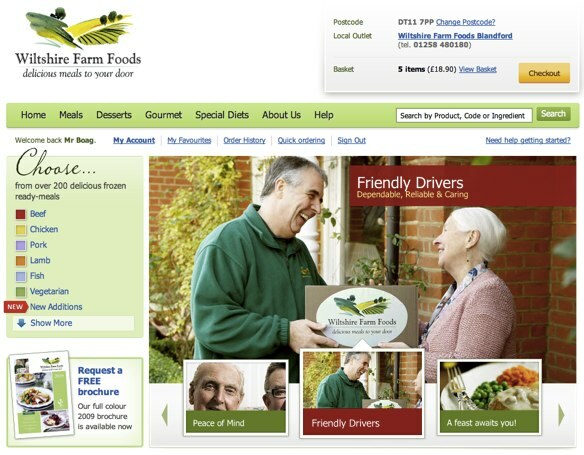 There is a lot that can be learned from the development of the Wiltshire Farm Foods website. We can learn about the importance of understanding your target audience and their motivations. We can learn how a perceived limitation in a business model can be turned into a strength. However, what excites me most is the opportunities provided by the Franchise model to engage with users in a more personal way that is lacking in many websites. With the growth of online social interaction there is the potential for an unprecedented level of customer care.